CHICAGO — The ease with which consumers can connect with businesses through the apps on their smartphones or the websites accessible from their personal computers has never been greater. A January 2014 Pew Research Center survey revealed that 87% of American adults use the Internet. Add to this the proliferation of smartphones—Pew reports that, as of October 2014, 64% of American adults have such a phone—and their increasing functionality places unparalleled tools at a consumer’s fingertips to easily order and customize service experiences. The idea of wash/dry/fold isn’t new, and neither is the concept of pickup and delivery. But developing an app through which a customer can order laundry service, share preferences and request delivery is a relatively new trend. A number of players have entered the market in hopes of capturing the do-it-for-me crowd. In metropolitan cities like New York, Chicago and San Francisco, or in commuter-heavy areas like Bakersfield, Calif., these businesses will gladly pick up one’s dirty laundry, have it cleaned, and then return their clothes to them for a price. 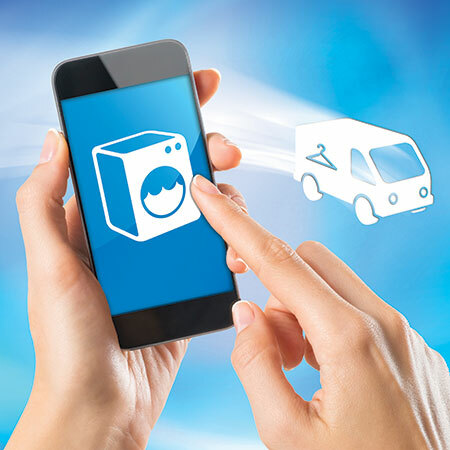 The companies behind these laundry service mobile apps either process the laundry in their own facility or they partner with a Laundromat or Laundromats in the service area to do the cleaning. American Coin-Op spoke to some developers of such mobile apps to get a sense of what they offer and where they see on-demand laundry services going in the future. Starchup is a new entry among the laundry app start-ups, having gone public in September. CEO Nick Chapleau co-founded it with Dan Tobon. They got the idea from Tobon’s father, whom Chapleau says works in marketing in the Laundromat industry. Starchup focuses on connecting a laundry or dry cleaner with customers they may not otherwise reach. There is no set-up fee. Each Starchup client receives a free trial, then a paid trial before full pricing—a monthly subscription fee plus a “small percentage” of each software-driven transaction—takes effect, according to Chapleau. Clients can choose from among different tiers of service to find a package that suits them. CD One Price Cleaners and Tide (“Tidespin”) are examples of companies that utilize the Starchup platform, according to Chapleau. Washio currently operates in Los Angeles, San Francisco, Washington D.C., Chicago, Boston and Oakland. It partners with an individual laundry provider and an individual dry cleaner in each market that does the garment cleaning, Metzner says. Each of these services’ creators believes that the use of technology to provide or enhance on-demand laundry and drycleaning services is really only getting started.